Starting your own business is a great achievement for any entrepreneur, but maintaining that company can be challenging. Any business, big or small, faces difficulties, including hiring the right people or branding your image. Reid Hoffman, in his book The Alliance: Managing Talent in the NetworkAge, emphasizes the need for a realistic loyalty pact between employer and employee that allows a business owner to view their employees as allies in the goal of transforming their company for the future. There are four key concepts that small business owners can master in order to ensure that they are successful, can enjoy their work, and can build successful relationships with their employees. • Find workers who are well-suited for their job and your organization; do they fit in to the culture of your company? • Create and implement a well-structured and systematic process for hiring. • Create an effective description for each position within your company. What role will they fill? What skillset do they need? What personality traits are important for completing their tasks? What previous experience would differentiate one candidate from another? • Maintain and update job descriptions on a regular basis. • Follow a process that includes multiple interviews. First do a phone interview focusing on each candidate’s skill set. Narrow them down for the next round of in-person interviews by focusing on those with the exact skill set you have previously identified for that particular position. They can then be invited to an in-person panel interview, and then narrowed down once more based on their interactions with the panel, before making a final decision between 2 or 3 final candidates. • Be prepared to invest time in training. The idea is to get employees to a point where they are competent and more knowledgeable about their tasks. The more an individual understands their job, the more you as the business owner can depend on them. • The key is to simply and verbally state to a new employee that you are training them. If you make this clear, the employee will take notes and assume responsibility for understanding what they are being taught. If you do not let them know, they may come back to you constantly with questions. • Effective management is based on training. People often forget that if they train, they will have to manage less. • Once time is taken in the beginning to make sure the employee is competent, you can schedule follow-ups but leave them to do their job. • Know your employees; where do their strengths lie? • Effectively communicate the task you are delegating; you can communicate in a variety of ways depending on the culture of the organization. For example, employees can be given the parameters for a specific project or you can allow them to brainstorm ways a project can be accomplished. • It is important to not be too protective of what you delegate and to be aware of your employees’ situations and work load. Never assume that you know how much someone can take on or that they are not already overloaded. Remember that companies that allow their employees to go after projects instead of waiting for them to be assigned tend to be more successful. 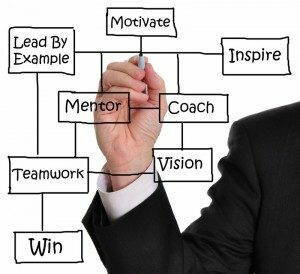 • Create a system that encourages follow-through by setting up a time you expect the employee to follow up with you. As the leader you will not have to remember so many appointments or tasks because you have asked them to get back to you at a prearranged time. This allows employees to know exactly what is expected of them and the deadline they have for accomplishing the tasks. • Create a culture of accountability so that employees understand that they are responsible for reaching certain goals by creating a system of reporting. • Designate certain times of the week, month and year that reporting on projects and planning need to occur and schedule them well in advance. • Rather than ignoring tasks that do not get completed for fear of confrontation, assume that 97% of the people who underperform do so because they do not know how to accomplish something or are unsure of the desired results. • Managers tend to tell people what they want over and over again by varying the way they deliver the message. Instead, ask employees where they are on a certain task, where they need more information, or what the process is looking like instead of downloading what you are thinking about the project onto them. • These four major concepts create a circular pattern of hiring and knowing your employees, checking in on the tasks that you have planned and delegated, to how you are communicating. Having the right people and ensuring that they are trained to be fully competent in the positions they fill means that communal planning and a culture of accountability are possible. Mastering these four concepts can make a small business thrive. Becoming proficient at these basics and upgrading them to a level of mentorship and guidance in your business will create a successful environment and company. Remember to stay in touch with employees by being engaged with them through routine coaching and involvement. Make sure to tell your employees that you are present with them because you care about them – their needs, wants, and passions. Whether you are starting a new small business, need guidance reinvigorating a failing one, or simply want to take your successful small business to the next level, a business coach can assist you on this journey. If you feel you or someone you know could benefit from these small business coaching services, please contact Carroll King Schuller of Organic Blueprints, Inc. at 804-288-0099.